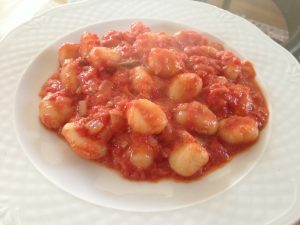 What I love about gnocchi is that they are cooked in 3 – 4 minutes and you can find so many kinds. From chunky ones, colorful ones, tiny balls or stuffed with delicious creamy flavors. Since gnocchi are quite neutral in their flavor you can combine them with so many different sauces. Today I will teach you how to make this traditional Italian gnocchi with Gorgonzola recipe. So lets start. Before you start preparing your sauce, put your water to boil and once it starts to boil add salt. Chop your onions into fine pieces (I have used 1 red onion and 1 shallot onion) and put them in your frying pan over a olive oil. 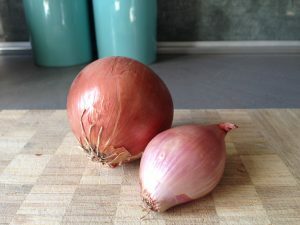 I have used a shallot here as it gives a tiny bit of a garlic flavor to a mix. Saute the onions over the low heat and once they become transparent add tomatoes pure. 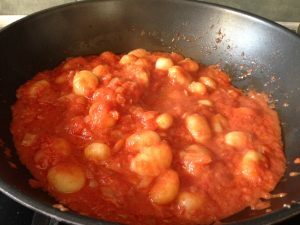 Let the tomatoes pure heat up slowly and make sure at this point of time water is boiling and you can add gnocchi and cook them as written on the packaging. Stir the tomatoes and add salt, pepper and flavor cube (if you like a strong taste). 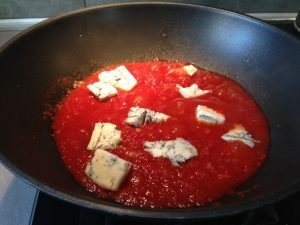 Make sure you don’t overdo with salt as cheese is salty and will flavor the sauce. 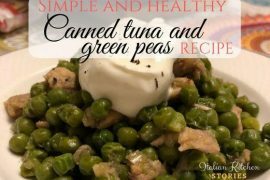 Chop it in chunks and add it to tomatoes string until it melts completely. 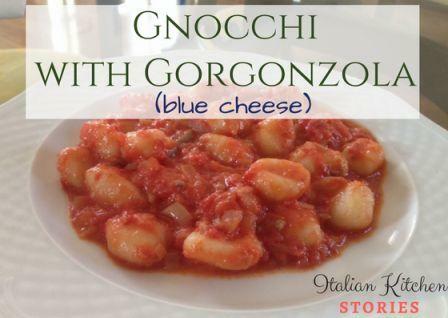 Once Gorgonzola has melted and you have obtained nice creamy light texture add gnocchi and mix it all well. Taste it and add more spices, salt or pepper as needed. Don’t keep it over the heat longer than 30 seconds while you are blending it all.